With the start of this dialogue, I was tumbling backward into old messages and self beliefs that were screaming:”If you don’t say YES, you are being selfish and uncaring.” I asked myself: “how they would manage without me?” Now that I had established my own familiar negative self talk of years past, it was easy to roll right into feeling Guilty. Luckily I was able to grab onto some important wisdom before I got swallowed up in this Guilt that would lead me to saying YES, when I knew I needed to say NO! And… as if by magic, I knew what it was! I needed to be true to myself, what was healthy for me, both physically and emotionally. I needed to focus on the commitments I had already made. I needed to realize that taking on one more thing would interfere with my fulfilling those obligations and needs. I also knew that if I did take on that one more thing, thinking I could squeeze it in, in the interests of helping, pleasing and not feeling Guilty, I would instead end up feeling Overwhelmed, Resentful and Untrue to myself. This would not be a good swap! The end of my counselor confession is that I did say NO. And, as I processed it, I knew I had done what was best. 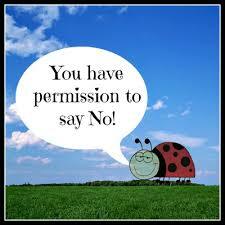 I just needed to give myself permission to say NO and allow myself to feel that it was Okay. If this small thing was such a struggle for me, how much larger would saying NO loom when we are in the midst of a major life transition? When we are being tossed about within the anxiety of change, whether it is divorce, career transition, aging, empty nest or retirement, the levels of old, familiar negative self talk get louder. Those negative voices can drown out all of our common sense and trust in knowing what we need and what we don’t. As we are questioning where we are going in our life path, we can learn a lot about ourselves in discovering our ability to claim our NO and stick to it. Most often the transition we are going through is in itself an expression of our NO to the status quo of our life situation and our choosing to change direction toward something more meaningful for ourselves. Asking yourself this question starts you out in the place you need to be. Only you will know what you are ready, willing and able to take on. Only you will know that if you are in the midst of a life transition, you may feel depleted and overwhelmed with it. Going outside yourself to take on some other obligation will only add to your fatigue and overwhelm. Make sure to take into account the scope of what someone is asking you to take on. Big or small, what is the amount of preparation and effort, both physical and emotional, that you will need to get it done? 2. How Might I Get Distracted? If saying YES to something will take you away from your job search, caring for yourself and your children during the adjustment to being a newly single parent, or giving yourself the time and space you need to grieve the loss of a loved one, then think again..,Maybe saying YES will not be wise or healthy for you. If you are plagued with Guilt over allowing yourself to say NO, consider that in your current situation and personal needs, you might not be able give the help you expect of yourself. 3. Can I Set Healthy Boundaries? Too often we say yes to tasks and projects that don’t belong to us. In this case, the person making the request may be hoping you will take something that they are reluctant or not prepared to do off their hands. This doesn’t help them take ownership of what is really theirs and can leave us feeling very resentful. Lessons in saying NO are the work of a lifetime, as they come up all the time and often without warning. Keep that phrase, “I’ll get back to you…” or, ” I’ll have to think about it…” in your pocket at all times to give you space and time to really sit with whether the request is something you can and want to take on. 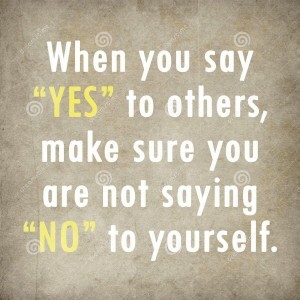 It really is okay to say NO, thoughtfully, simply and clearly. It is not Selfish! It is the Healthy way we take care of ourselves. Need help learning to say NO? Give me a call and we can work on it together.